The first auto show happened in 1901 in Chicago and Chicago’s is still the largest auto show in North America. 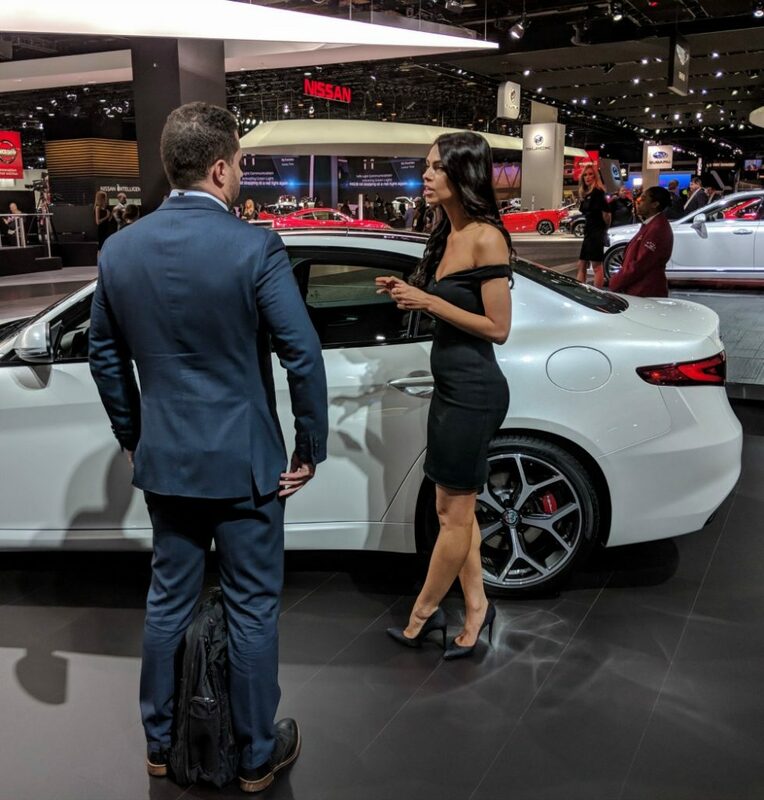 But the 110th Chicago Auto Show in early February 2018 bore little resemblance to that early effort. Today, auto shows are all about pomp, presentation and pizzazz. The displays are spiced up with mega multimedia, bright lights, pounding music and plenty of hip virtual reality. 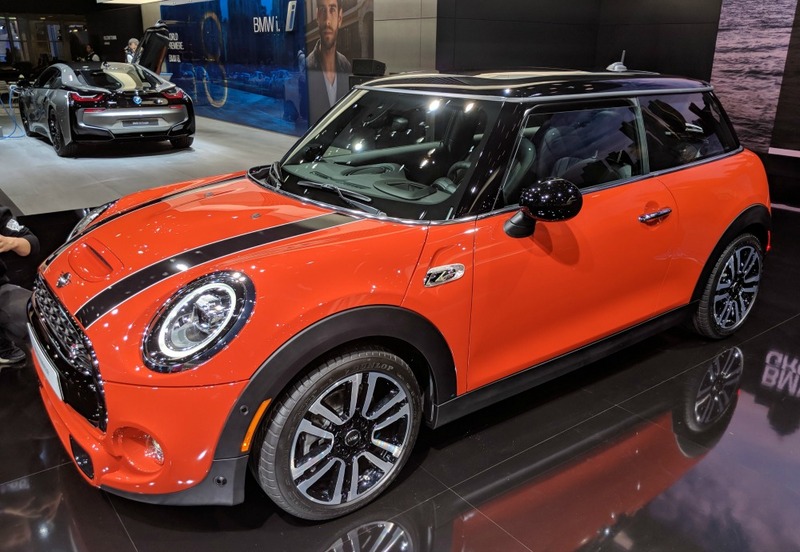 Here are 10 things to do at an auto show with kids, and why you should take the family, even if you aren’t planning to buy a new car this year—and a little about the right (and wrong) car to drive there. 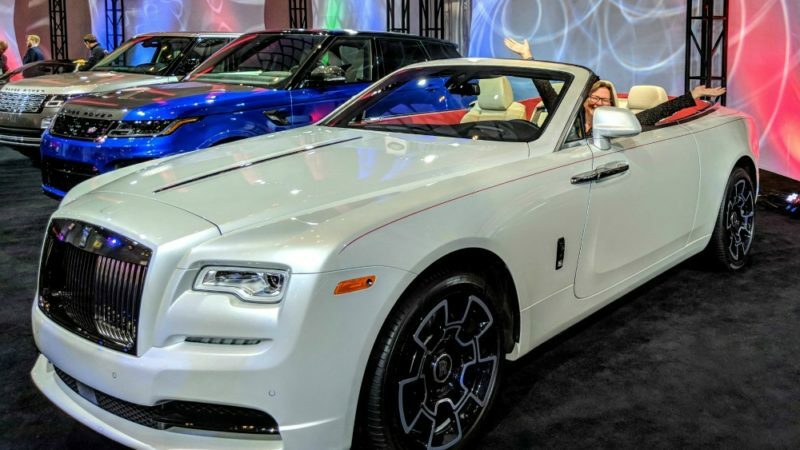 Auto shows are about selling vehicles, but in a no-pressure, highly stylized way. That means the automakers aim to get consumers excited about cars rather than getting them to sign on the bottom line. 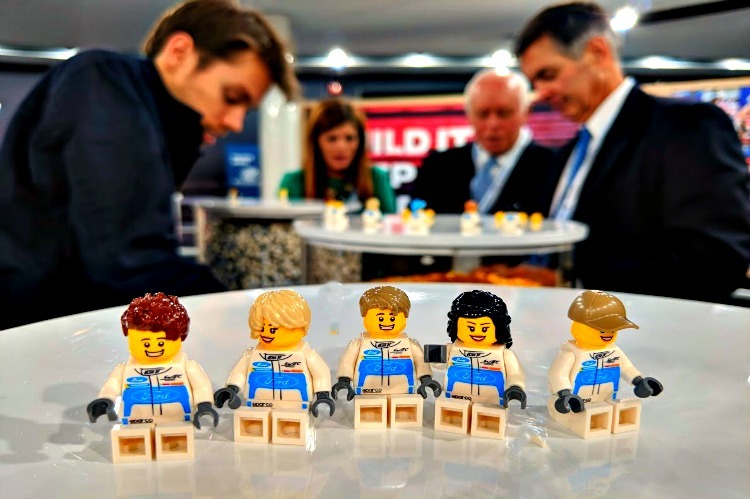 If the companies are successful at the show, they hope it will mean they also will be successful later at the dealership. 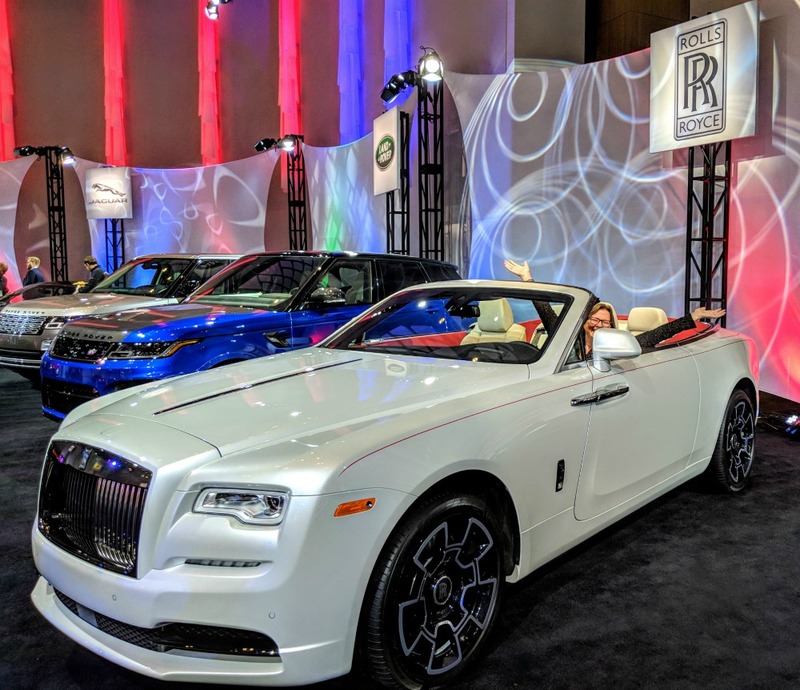 Why should you want to go to an auto show? Even more important, should you go to an auto show with kids? Here are 10 reasons why you should consider it. Unless you are headed to a major city that is well served with public transit—from subways to Ubers—chances are you need a car to get around. 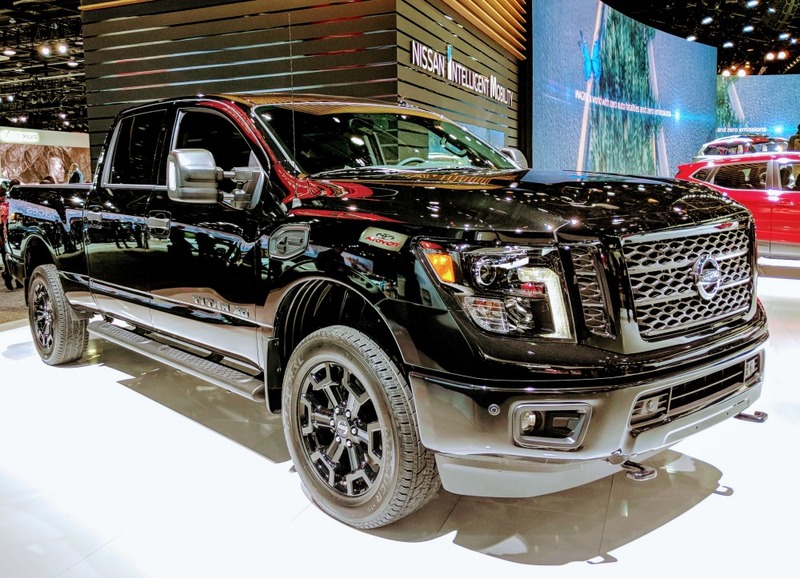 An auto show gives you an overview of what’s new in cars and trucks—whether you need to know what new features will make a road trip more fun or you want to know which car to rent at the airport, getting a look at models from a wide variety of manufacturers will help hone your choices. There are production and pre-production models, with a few cool concept cars or classic cars sprinkled about to keep the excitement up. 2. These are Not Your Parents’ Cars. If you are an average American, you drive a car that is more than 11 years old. (Mine is a 2003—so even older than that!) That means you don’t have hot tech like 360-degree birds-eye-view cameras. Or park assist. You probably don’t even have basic tech like backup cameras, which will be standard on all vehicles built on or after May 1, 2018. 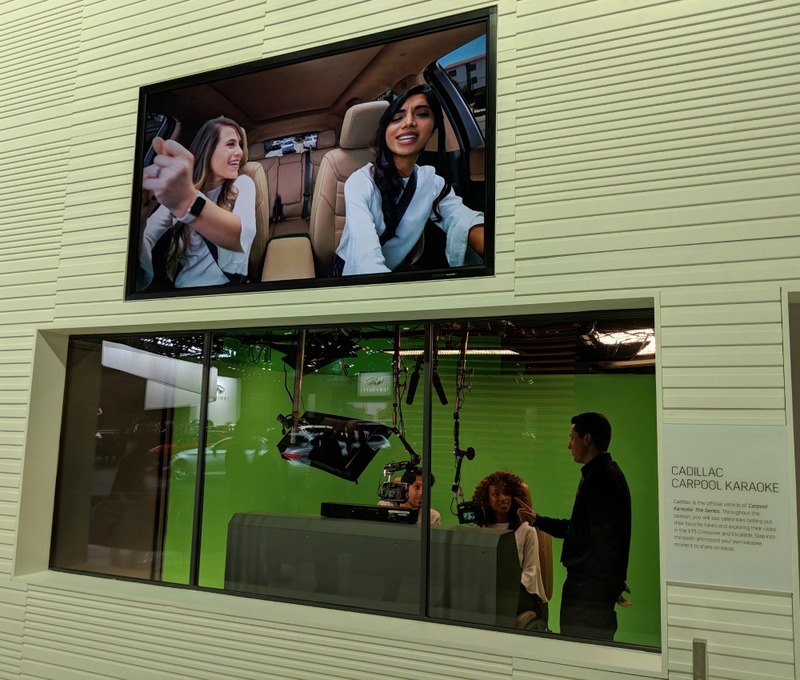 Walking around an auto show today is part new car showroom and part CES wow. 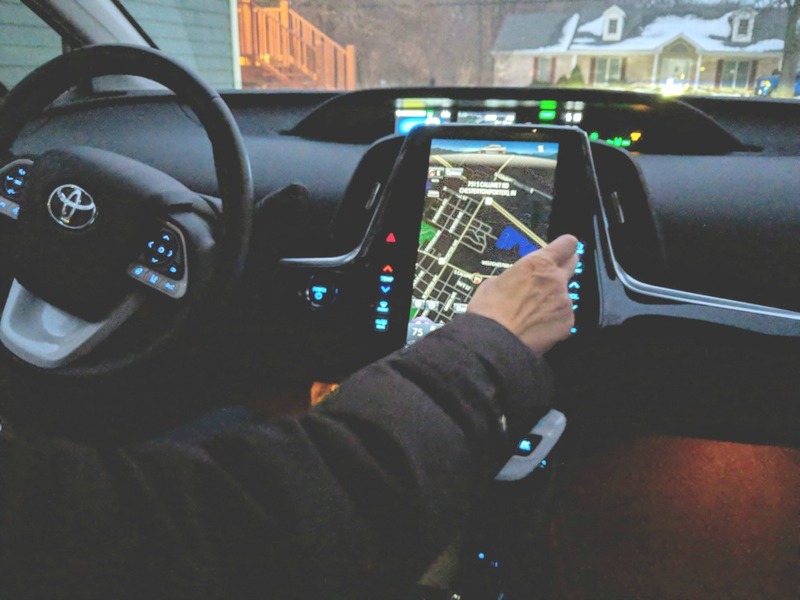 There are fewer “concept” cars with futuristic design, but far more displays showing off the tech that helps drivers take the first baby steps to the future of self-driving cars. And it’s all displayed in an eye-candy way that is anything but boring, even to kids. These days, Japanese cars are built in Kentucky and Alabama and German cars are built in South Carolina and Tennessee. And the manufacturers work hard to make sure consumers know that in our #MAGA (Make American Great Again) political climate. It makes for a nice social studies or political science lesson for teens. 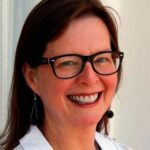 Let the kids put on those attractive headsets and take a tour of a virtual future world with driverless cars. Or let them virtually drive an off road course. Or get a video of your family’s Carpool Karaoke experience. 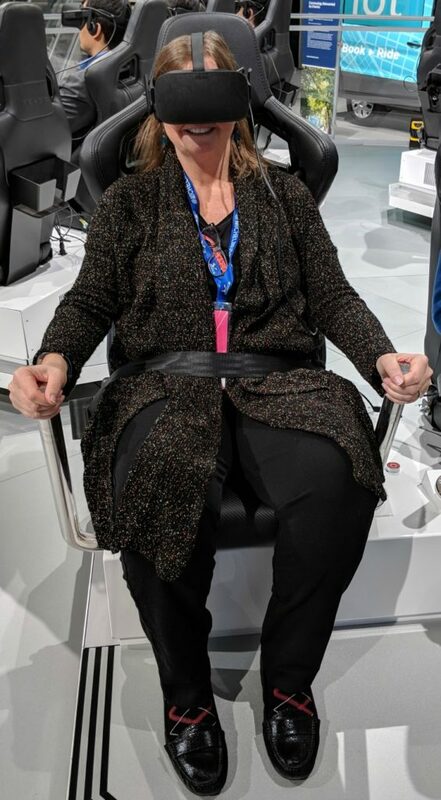 All of those experiences were available at the auto show in Detroit. Literally. Crawl inside a Bugati. Or Rolls. Then have someone snap a photo for your Instagram account. Or stay more in tune with reality and let the whole family pile into a Honda Odyssey minivan to see how well everyone fits. Go ahead. Let the kids crawl around and touch–even the sports cars. It’s OK. There will be a whole crew of people armed with Windex and wipes trailing behind you. Sadly, it likely won’t be a Bugati. 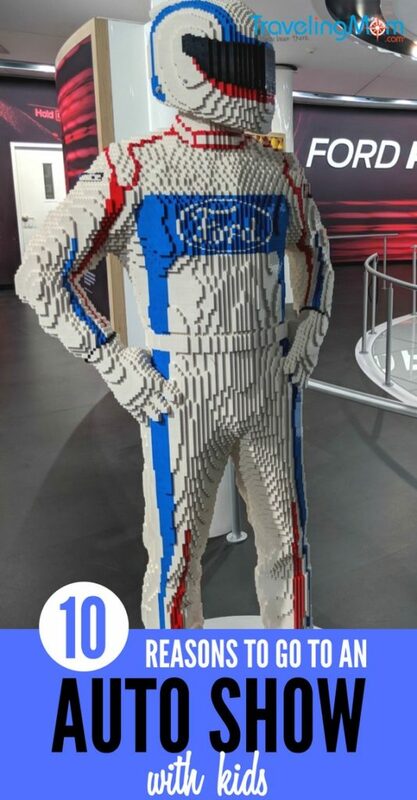 But at the Ford exhibit at the 2018 North American International Auto Show in Detroit, kids could make and keep their own LEGO figure. OK, not just kids. Adults were making them too. Also at the Ford exhibit was a bit of motor history: the hot Mustang Steve McQueen used in filming “Bullitt,” the 1968 movie that includes one of the best car chase scenes ever recorded. Ford is bringing back the Shelby GT 500. New was parked next to old at the Detroit Auto Show. 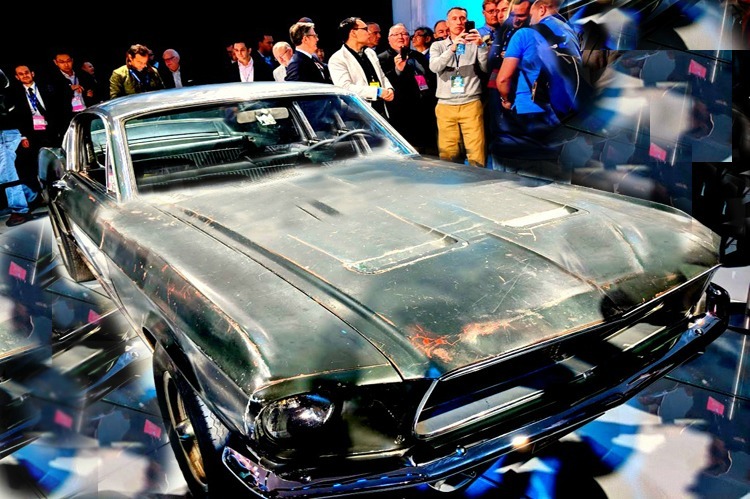 Ford promises the new Bullitt Mustang will be “the most powerful street legal car.” If the kids aren’t impressed with that dull and dented original, show them the film chase sequence when you get home. No. Tesla was not at the auto show in Detroit or the one in Chicago. But there were plenty of electric vehicles to explore. Show the kids how to “gas up” an electric car. Cars are hardly the only feature of an auto show these days. There are SUVs, off road vehicles, and trucks. Really big trucks. Like the 2018 Ram 1500. It’s a truck made for families—with all the creature comforts you want. Step inside and imagine yourself driving a really cool looking truck around town. Let the little ones climb inside and indulge their inner cowboy. I remember going to the Chicago Auto Show as a tween. My parents would be car shopping, I would be looking at those impossibly beautiful women in their impossibly high heels and gorgeous gowns. Their job: To stand next to a shiny car. They weren’t there to talk. The impossibly beautiful women are still everywhere at an auto and they are still wearing impossibly high heels. But these days they wear more sensible dresses—think Jackie O sheath dresses—and they carry iPads. Why? Because they are now “product specialists.” That means they have been trained to talk about the vehicles. They consult the iPads for the finer details. There are a surprising number of auto shows around the country, some big, some huge (Chicago is the largest) and some small. But all offer the opportunity to see the latest the industry has to offer. And all give you a chance to browse, pressure-free. Here’s a list of the places, from New York to Los Angeles, and the auto show dates coming to a convention center near you. Before you buy tickets, however, check online. Chances are you’ll find ticket offers or even free tickets. 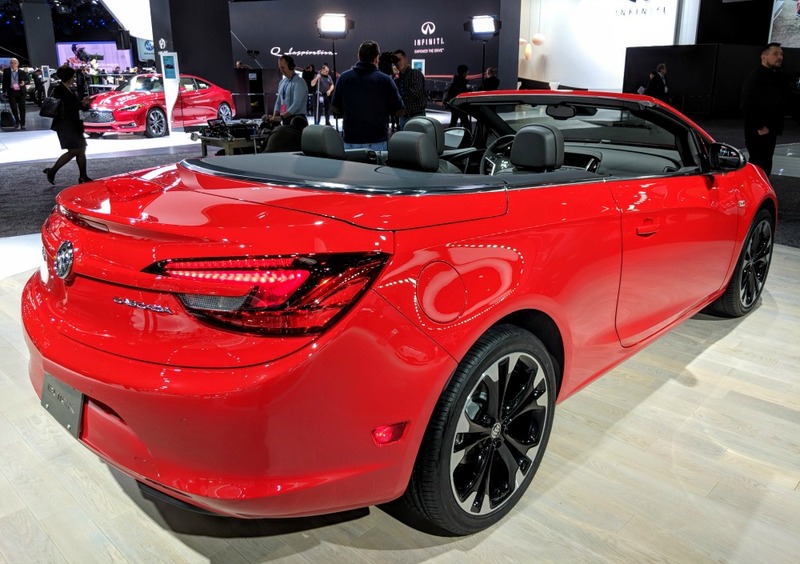 Remember: The automobile dealers association that puts on the auto shows wants you to come to an auto show to get excited about the new models so you will head to your local dealership for a test drive. I drove from Chicago to Detroit for the 2018 North American International Auto Show in the heart of a winter storm. 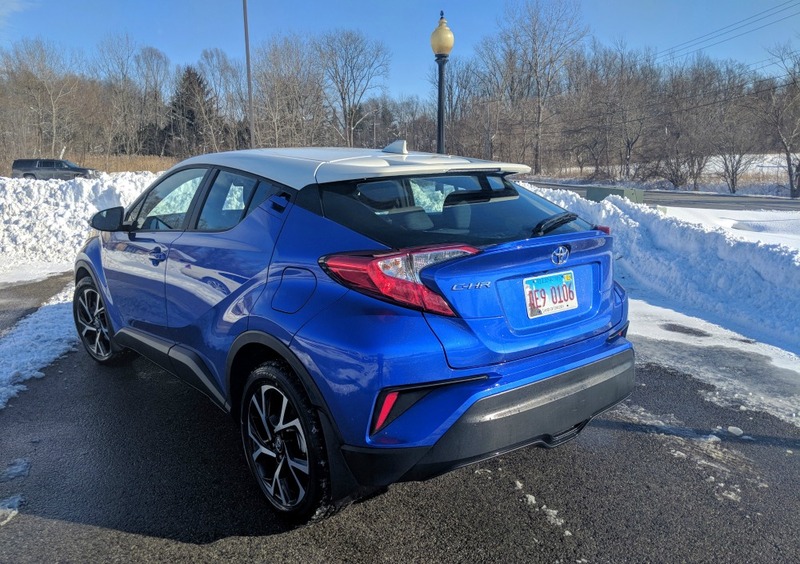 So I was glad I was driving the 2018 Toyota C-HR XLE Premium SUV crossover Toyota had loaned me for the week. It gripped the snow-slicked roads and road high enough to give me a decent view of the traffic ahead. I also liked the slick design of this car. And the heated seats. But in that wintery muck, the thing I liked the most was the Toyota Safety Sense package. It includes pre-collision warning, automatic high beam headlights and lane departure warnings. 5-star overall safety rating. The car handled well and made me fell safe and comfortable even driving in less-than-terrific road conditions. The Toyota Safety Sense package is standard on Toyotas. It includes the pre-collision warning system that helps prevent front-end collisions, an alert if you veer out of your lane, a system that automatically toggles between low and high beams so you don’t have to remember to do it yourself, and my favorite—automatically adjustable cruise control that slows the car to maintain a certain distance between you and the car in front of you. Blind spot monitors, rear cross traffic alert and back-up camera. 10—count ‘em, 10—airbags. They’re all over— driver and front passenger airbags, driver and front passenger and rear seat-mounted side airbags, driver knee airbag, front passenger seat-cushion airbag, and front and rear side curtain airbags. Comfortable seats and ride for a smaller crossover. The cockpit design meant everything was within easy reach on my solo road trip between Chicago and Detroit. It seats five, but three adults in the back would be a tight fit. It’s rated for 31 mpg on the highway. But the challenging weather meant I got slightly less than that. I didn’t need the extra storage space, but the rear seat can be folded down in a 60/40 split fold-flat second-row rear seat for carrying bigger cargo. This car starts at $22,500. The XLE model starts at $24,350. The premium model I drove sells for $26,133, including $960 in delivery charges. The week after I returned from Detroit, Toyota loaned me another car to check out: the 2018 Prius Prime. I had long wanted to drive a 2018 Toyota Prius Prime. I’ve heard such great things about this car. Sadly, the winter weather did not let up. And The Prius did not handle the slick roads nearly as well as the C-HR. I did not feel comfortable driving this shiny new car. So, despite my desire, I can’t offer a full review of the Prius Prime. It’s roomy and comfortable inside–much, much more interior space than the big SUV I normally drive. 5-star safety rating, the Toyota Safety Sense package and plenty of airbags. Huge 11.5 inch display screen, head-up display on the windshield, and 60-40 split rear seats. This hybrid is rated for 54 mpg. I kept well within the 25 mile range for its electric motor, so I got closer to the 133 mpg rating for electric-only use. The Prius Prime starts at $27,100. The model I drove sells for $33,985, including $885 in delivery charges. Have you been to an auto show lately? What did you think?